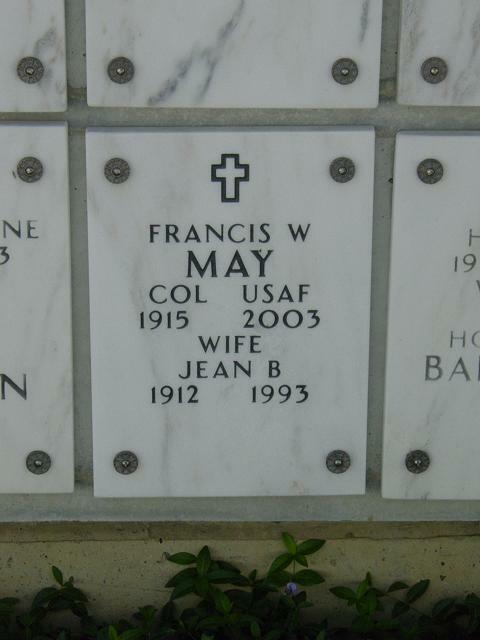 Francis (Frank) William May, Colonel, United States Air Force, of Venice, Florida, died October 11, 2003. He was born on August 11, 1915 in Washington, D.C. and moved to Venice (after several years as a winter resident) from Alexandria, Virginia, in 1975. He spent most of his career as a civil servant for the Department of the Air Force during World War II and Korea and participated in the planning for the D-Day invasion. He receive a law degree from Columbus University. He was a member of the Retired Officers Association of Former OSI Special Agents USAF and was a past president and director of the National Classification Society and a former member of the Federal Bar Association. He was a member of the Venice Elks, Venice Yacht Club, and a charter member of Jacaranda West Country Club. Survivors include his son William H. (Barbara) of Villa Park, California; two grandchildren, a stepson and a step-grandson. Memorial services will be held on Thursday, November 20, 2003 at 9 a.m. at Arlington National Cemetery with inurnment to follow. Memorial donations may be made to Our Lady of Lourdes Church, 1301 Center Rd., Venice, Florida 34293 or Hospice of Southwest Florida, 5955 Rand Blvd., Sarasota, Florida 34238.